Deb Kerr comes to Intuit from a 17-year career at the John G. Shedd Aquarium, where she held progressively responsible positions, including executive vice president from 1999-2010. She is a past board member of the Association of Zoos and Aquariums, and past chair and instructor for its Professional Development Committee and management courses, and past chair of the zoo and aquarium committee for the International Association of Amusement Parks and Attractions. She serves on the board for the Merit School of Music and on the National Wildlife Federation’s Great Lakes Leaders Council, and is a member of the American Alliance of Museums and a past board member of the National Veterans Art Museum. She is a frequent guest speaker on issues related to museum relevance, teen empowerment and activating the public for social good. Alison Amick received her MA in Art History from Indiana University in 2002. Amick's interest in outsider and self-taught art led her to Intuit, where she began as a volunteer. Prior to joining Intuit in 2016, she served as a curator at the Oklahoma City Museum of Art for more than a decade. Julie Blake joined the Intuit staff in 2017 as a marketing intern through the museum studies program at Oakton Community College. A life-long learner, Julie holds a bachelor’s in art from Northern Illinois University and an MBA from the University of Phoenix. She brings direct experience in business development, strategic planning, customer relationship management, branding, marketing and public relations and loves collaborating in environments where she can combine her right and left brain functions. Julie has been creating visual and performing art since an early age, and is drawn to the power of outsider art and Intuit's mission to promote its awareness. Theodore Braziunas received his bachelor's degree from Skidmore College in 2018, completing studies in Management & Business as well as Arts Administration. 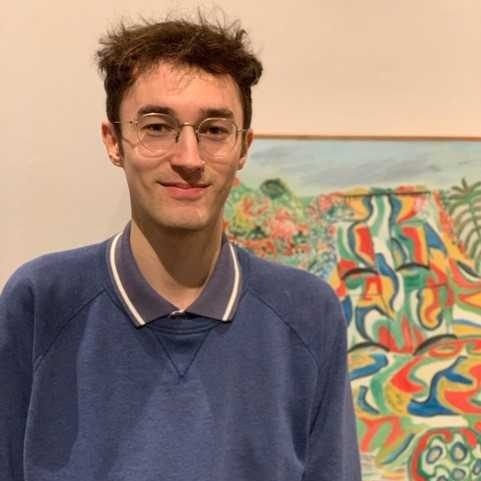 Working as a gallery assistant within the Skidmore Art Department, Theodore founded and produced an experimental performance series with the goal of providing student and faculty artists with a space that promotes the intersection of mediums and encourages community collaboration. A lifelong appreciation for the arts and a passion for developing programs designed to elevate emerging and underrepresented artists is what drew Theodore to Intuit and as a Chicago native, he looks forward to sharing the magic of outsider art with the city’s countless creators and eager patrons. Jane Castro received her bachelor's degree from Northwestern University where she studied Anthropology with an academic concentration in cultural history and ethnographic methods. Jane's interest in public engagement and informal education led her to Intuit where she began as an education intern. She brings to Intuit past programming and museum experience from her time as the Field Trip Director for Supplies For Dreams, a non-profit dedicated to providing extracurricular experiences to CPS students. Jane is interested in how outsider art opens dialogues about underrepresented identities, regions and cultures. Christophe Delaunay graduated from the University of Wisconsin-Madison in 2016 with bachelor's degrees in history and Scandinavian studies, with a minor in digital studies. While in Madison, Christophe was involved with various art museums and organizations, including the Madison Museum of Contemporary Art, Chazen Museum of Art and Bubbler Gallery. Shortly after graduating, Christophe moved to Chicago, where he was drawn to Intuit by his interest in outsider and self-taught art, first as a volunteer and intern, before joining the staff. When not at Intuit, Christophe can be found coaching competitive rowing teams on the Chicago River. Claire Fassnacht received her master’s degree in arts administration from Boston University in 2017. In summer of 2015 Claire co-facilitated the IntuiTeens summer youth program at Intuit, from which her exploration and interest for outsider art stemmed. While living in Boston, she was the student services administrator with Boston Ballet School, responsible for website building, data management and customer relations. An appreciator to many types of art, Claire is also a gamelan musician and dancer and holds a bachelor’s in percussion performance from Lawrence University. Melissa Smith received a BFA in Painting and Drawing from the School of the Art Institute of Chicago as a Merit Scholarship Recipient in 2005 and a MA in Teaching from Roosevelt University in 2011. She has also completed coursework in Museum Studies at Northwestern University. Prior to joining the Intuit staff in 2015, Melissa served as a high school art teacher in Chicago and a teaching artist at various nonprofit organizations in Illinois. She is committed to making museums into places of vitality—fostering learning, discussion, connection and transformation—accessible to all. Melissa is also a practicing artist with a focus on mixed media works. Christina Stavros received a BFA in Printmaking with a minor in Art History from Pennsylvania State University in 2014. Christina's life-long passion for the arts led her to Intuit where she began as an intern in the Collections and Exhibitions Department. Christina comes to Intuit with past gallery and events experience. She also continues to practice the arts through painting and mixed media works. Annaleigh Wetzel earned her bachelor's degree from the University of Wisconsin-Madison School of Journalism and Mass Communications. Her academic emphases were reporting, strategic communications, as well as gender and women's studies. After working in public relations and writing, she was drawn to Intuit through her interest in creativity and community-focused programming.